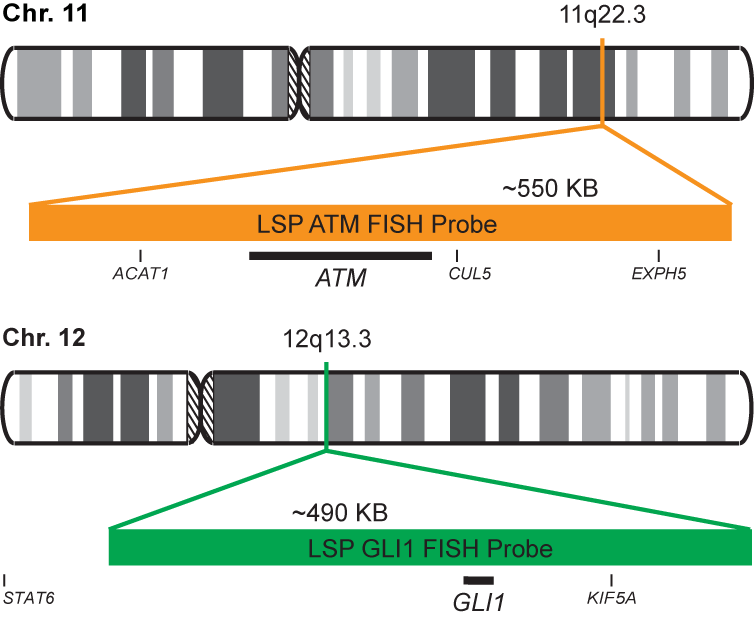 The ATM/GLI1 FISH Probe Kit is designed to detect rearrangements involving the human ATM and GLI1 genes located on chromosome bands 11q22.3 and 12q13.3, respectively. Abnormalities in ATM – also known as AT1, ATA, ATC, ATD, ATE, ATDC, TEL1 or TELO1 – occur in ataxia telangiectasia, and have also been observed in chronic lymphocytic leukemia (CLL) and other malignancies. The GLI1 gene – also called GLI – is an oncogene that is expressed and sometimes amplified in several human cancers.